It’s a day when everybody’s blood runs green as we all remember where we came from. People across the world stop for one day to remember their ancestors who took the brave step of leaving their home in search of a better life. Some driven by poverty, some by hunger and some because there was a dream of a better life for their children. For Irish-Americans and all descendants of those Irish people across the world. You are those children. 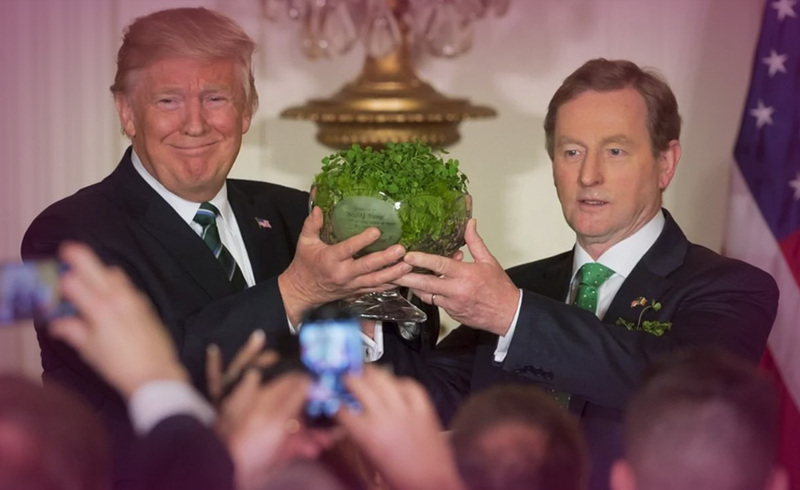 On Saint Patricks day 2017, Enda Kenny the Irish Prime minister or Taoiseach (Tee-Shock) as he is called in Ireland. Delivered a speech in the presence of President Donald Trump, to remind people across the world, that even Saint Patrick was an immigrant. 33.3 million American people are the sons and daughters of Irish Immigrants. What do the cards say about the immigration scenario? The Ten of Coins This concentrates on the domestic finances, growth and development. This cannot be achieved alone and never was. It is a combination of many efforts from many nations over many generations. Change is normal to achieve our heart’s desire, it’s rarely comfortable, but it is always needed. Most of the forefathers of America today came to the shore, not from the shores of America. The change happened to incorporate this and allow this to grow. The Four of Wands Wands represents energy and work and dreams. The non-solid things that are as much a part of our lives as the solid. Four is a balance, it means not too much for anyone and a little for each. Harmony needs to be restored, with the realisation that all points of view are important, all energies are needed, once the result is for the higher good of all. People are stronger when they unite for a common good. The Three of Cups Within each person, is a whole inverse of many lives. We carry within us the message of many nations, not just one. Nations and borders are man-made, not God-made or made by mother nature. We need to understand that to be truly great, we must embrace others and educate ourselves on their ways and not lose ours. Ignorance is the enemy of peace and tolerance. Education brings down barriers. The cards simply spell out how America came to be. She wasn’t built on closed borders or broken class systems. She was built by hard work from people of many nations colours and creeds, not just one. She is the very embodiment of how a society can come together under one flag and help a nation to be great. If immigration is what built America and has carved her into the country that is loved today, then why stop now? While Liberty holds her lamp, may there be liberty and justice for all.